NMM 4203. Lira da braccio by Francesco Linarol, Venice, 1563. Ex coll. : W. E. Hill & Sons, London. Rawlins Fund, 1988. One of the most important stringed instruments of the Renaissance, the lira da braccio was used primarily by courtly poet-musicians in Italy to accompany themselves while reciting poetry. 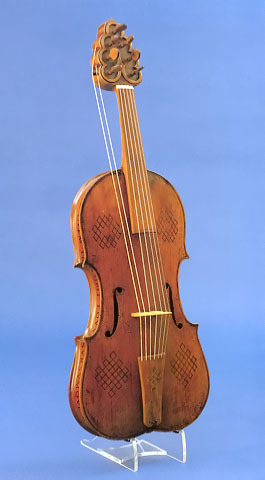 The five strings over the fingerboard were played with a bow, while the two strings on the instrument's bass side were plucked by the player's left thumb. A Latin motto or saying is painted on the carved ribs of this lira da braccio and describes the playing of the instrument. It can be translated: "while the horse [referring to the horse-hair on the bow] crosses the sheep [referring to the strings, traditionally made of sheep gut] up and down, the wood [referring to the lira] returns a mellifluous sound; hail the playing hand."